Advantech has powered thousands of DOOH digital signage networks with our digital signage solutions bundled with digital signage software and can connect with WiFi, 3G or LTE module for diverse communication. Advantech offers fanless and low power digital signage players suitable for simple digital signage applications which are perfect fit for budget concerned customers. Advantech Ultra Slim Digital Signage Players are industry’s slimmest digital signage player measured only 19 mm in profile in a small 18 x 19 cm footprint. The series features fanless and cableless design and supports up to dual 4K UHD contant. 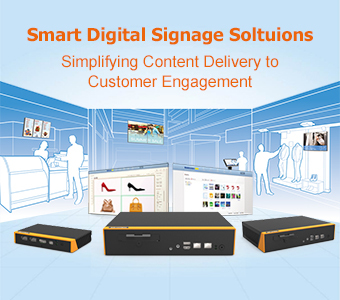 These digital signage players come integrated with both WISE-PaaS/SignageCMS multimedia content management software, and WISE-PaaS/RMM remote device management software for easy signage network management. Multi-Display Digital Signage Solutions support up to seven displays and high performance graphics up to 4K content and are ideal for video walls and multi-display applications. Advantech DS-570 is integrated with Intel® Celeron® N2930/ J1900 Quad-core processor with an integrated nVidia GeForce GT 730M graphic engine for Ultra HD playback signage player. DS-570 features rich video outputs including 2 x HDMI, 1 x DP , and 1 x VGA for up to multiple displays (any 2, 3, up to 4 displays). The OPS signage Solutions are certified with Intel® Open Pluggable Specificationwhich allows easy maintenance and upgrades and support up to 4K resolution. Advantech also provides storage and wifi modules which are compatible with our digital signage solutions with with long lifecycle support. Advantech has powered thousands of DOOH digital signage networks across every market such as retail, hospitality and public transportation with turnkey signage offerings. All Advantech digital signage players come pre-loaded with an embedded OS, and at no extra cost, -digital Signage software, Acronis data protection software, and system security software by McAfee. Advantech has the most complete digital signage media players available to provide solutions with varied computing power and cost structures from entry-level, fanless, low power systems supporting dual Full HD displays, to high-end systems providing more advanced features and supporting independent multiple displays. With our hardware/software ready digital sign solutions, System Integrators can save important development time and focus on their own applications. Results : better apps, and quicker time-to-market.